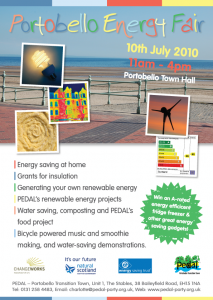 Please come along to our Energy fair in Portobello Town Hall. 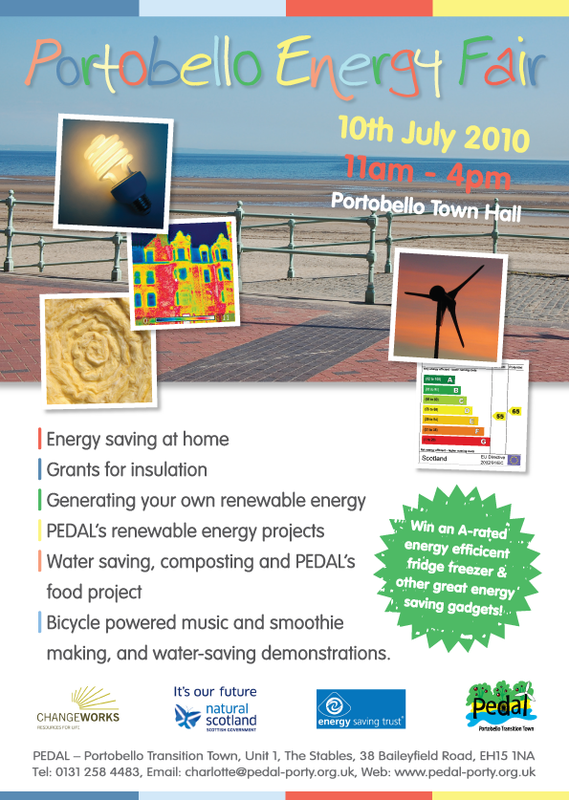 Between 11am and 4pm there will be altern­at­ive energy demos includ­ing bicycle powered music and smooth­ie mak­ing. You will be able to get energy advice, inform­a­tion on renew­able energy for your home, and advice on insu­la­tion grants. Find out about about PEDAL’s renew­able energy plans, and oppor­tun­it­ies to get involved in PEDAL pro­jects. There will also be inform­a­tion about PEDAL food pro­jects, as well as com­post­ing and waste reduc­tion tips. Not for­get­ting a fant­ast­ic prize draw, with a first prize of an A rated energy effi­cient fridge freez­er, plus oth­er great energy-sav­ing gad­gets! This entry was posted in Energy, events. Bookmark the permalink.